Spiromatic 90-U, High performance Breathing Apparatus. This basic version does not provide an 'extra-air' point, or umbilical attachment; but this can be added from after-market accessories. The cylinder band is provided by a webbing strap, which tightens on a 'cam-lock' buckle; which adjusts to a range of cylinder types and sizes. 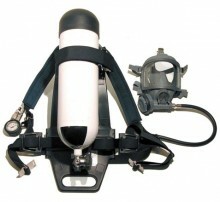 The harness is of conventional, belt and two shoulder strap design, with individual adjustment on each of three points. On all of them, are provided ample arrangement for attaching Distress Signal Units, torches and 'extra' air connections, so that, very easily, the kit lends itself to use from airlines (umbilical supply) without fuss - and for deep penetration jobs, of course the Self-contained cylinder acts as emergency, or escape air. These features add up to 'bullet-proof' performance and reliability at a price no higher than an ordinary BA set. This brand is by far the most economic in spares and repairs, duty for duty. Click the button below to add the Spiromatic 90 U, cw QC: SCBA, Re-conditioned, 12 month warranty to your wish list.